The blockchain is an efficient database model that facilitates online transactions where participating network members can securely share transaction information among them using a distributed ledger technique. This distributed database model utilizes sophisticated technology and techniques to efficiently offer to protect the data records from being tampered with by the participants or operators. Tamper-proof transparency and high level of data integrity are the USP of Blockchain technology. Collection of the transactions that occur during the interval of 10 minutes to get the information verified is called a Block and multiple series of this form is known as Blockchain. The ease of use, elimination of middlemen and tamper-proof structure makes Blockchain Technology appealing for the corporate sector across the world. While developed nations have already started realizing the primary benefits of BlockChain technology the developing parts of the Globe have also started moving beyond baby steps. 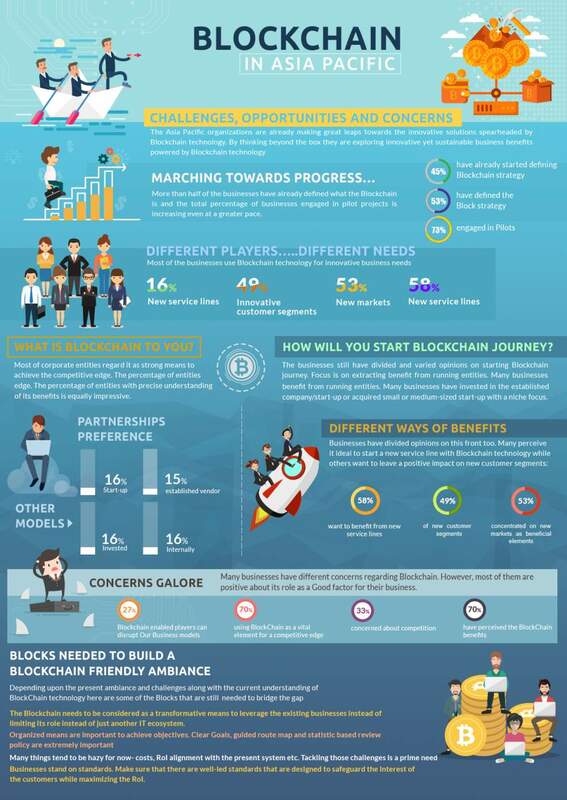 Here are some interesting points highlighting the use of Blockchain technology in Asia Pacific region and how is it used by the corporate sector as a practical means of business growth and their concerns. Contrary to the common perception, the corporate entities of Asia Pacific Region have already started implementing the solutions to know the real-life implications of the same and some have even started with the Blockchain pilot projects. Apart from exploring innovative avenues, these entities are utilizing the Blockchain technology for better performance of the existing business model. However, it seems that businesses still have to gain a clear perspective of ideal route map like deciding ideal model, leveraging infrastructure and manpower and determining RoI of the investment. With time this issue should be resolved. The businesses with good resources and manpower are open to starting the journey on their own. However, many businesses are interested in taking the safer option instead of by investing in the running Blockchain start-ups. This model seems even better as it can allow for the wholesome growth of the market. The capable entities can safely judge the waters without disturbing their focus on the running business while the enthusiastic start-ups can get the required monetary resources to confidently march ahead. While different businesses take different routes, it can safely be said that the number of businesses that are interested in utilizing Blockchain technology is fast increasing. The destination is important but the route should not be taken lightly either. In fact, that approach would defeat the very objective of adopting Blockchain in the business. Waiting till everything is clear can put you in the backseat. Jumping headlong can be self-harming. Find the Golden midway can be the best solution. The best way is to "learn while you earn" approach by partnering with start-ups possessing know-how. It will help the businesses to test the market, judge RoI and determine the ideal efforts. Corporate entities have different opinions about the impact of Blockchain on their business. Many corporate entities think that their business model can be disrupted by the Blockchain enabled players and their concerns are not without a reason. Understandably today as a huge portion of the business is done online any cutting-edge digital capability over the traditional competitors can result in a massive impact. That is why many corporate entities are interested in learning various commercial aspects of Blockchain. The main aim is to use Blockhain integration as a means to enhance the RoI of their present business model. At the same time, many businesses concentrate on how to explore the new and untapped market with the help of Blockchain Technology. It could be a good thing but the main focus should be on realizing the commercial import of the brainstorming sessions or real life efforts before it is too late. Being speculative for long only to find out at the end than the efforts did not have any commercial usability is something that is not desirable at all.